"The Punjab Government under the visionary leadership of Chief Minister Captain Amarinder Singh has given prominence to women in each sphere and the 50 percent reservation to women in the Urban Local Bodies and Panchayati Raj Institutions is a clear cut proof of that." 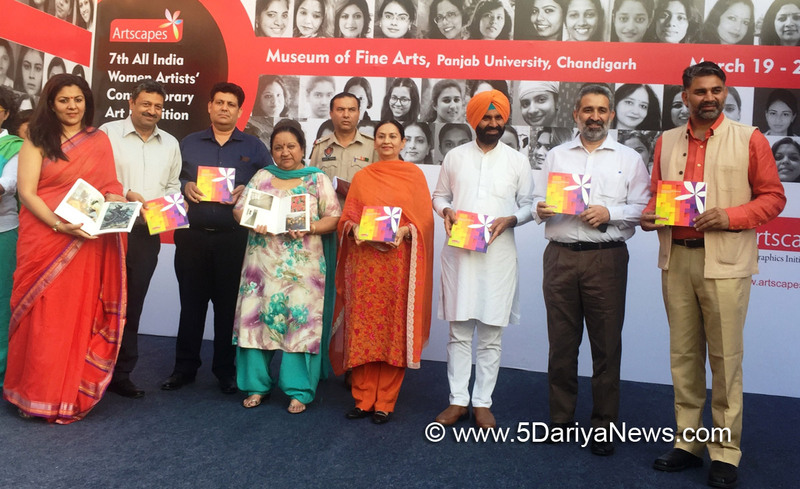 These views were expressed here today at Museum of Fine Arts, Panjab University Chandigarh by the Education Minister, Punjab, Mrs. Aruna Chaudhary on the occasion of inaugurating Artscapes 7th All India Women Artists Contemporary Art Exhibition, 2018. The exhibition would continue till 28th March.The minister further said that women in today's era are making a mark in every sphere of life which bodes well for the holistic development of the society. The minister also said that Artscapes deserves to be applauded for encouraging the artistic talent of women whether it's related to Painting, Sculptures or Photography. Describing such exhibitions as a perfect platform for making the budding artist present in every women blossom, Mrs. Chaudhary emphasised holding of such initiatives on regular intervals.Mrs. Chaudhary on the occasion also gave away prizes to the women artists in several categories and encouraged them to follow their dreams. The minister also visited the exhibition and profusely praised the exceptional work done by the artists.Among others present on the occasion included MLA Bassi Pathana Mr. Gurpreet Singh GP, Dean of University Instruction, Panjab University, Chandigarh Mrs. Meenakshi Malhotra, Chairman of the Department of Fine Arts Mr. Tirthankar Bhattacharya, Principal Promoter Artscapes Suraj Mukhi Sharma, Secretary Artscapes Simrat Sharma, Syndicate and Senate Member of Panjab University Mr. Dayal Partap Singh Randhawa and Honorary Co-ordinator Artscapes Anjali S. Aggarwal.